Indonesian heightened flight warnings around Bali's Mount Agung on Sunday as the volcano's eruptions sent a plume of volcanic ash and steam more than 6,000 meters into the skies. Mount Agung volcano erupts as seen from Culik Village, Karangasem, Bali, Indonesia November 26, 2017 in this photo taken by Antara Foto. Indonesian and regional authorities heightened flight warnings around Bali’s Mount Agung on Sunday as the volcano’s eruptions sent a plume of volcanic ash and steam more than 6,000 meters into the skies above the popular holiday island. Ash covered roads, cars and buildings near the volcano in the northeast of the island, while overnight a red glow of what appeared to be magma could be seen in photographs by Antara, the state news agency. “The activity of Mount Agung has entered the magmatic eruption phase, it is still spewing ash at the moment, but we need to monitor and be cautious over the possibility of a strong, explosive eruption,” said Gede Suantika, an official at the volcanology and geological disaster mitigation agency. Bali, famous for its surf, beaches and temples, attracted nearly 5 million visitors last year, but business has slumped in areas around the volcano since September when Agung’s volcanic tremors began to increase. Agung rises majestically over eastern Bali at a height of just over 3,000 meters. When it last erupted in 1963 it killed more than 1,000 people and razed several villages. Maps provided by VACC show an area of ash cloud heading southeast over the neighboring island of Lombok, away from Bali’s capital, Denpasar, where the main international airport is located. 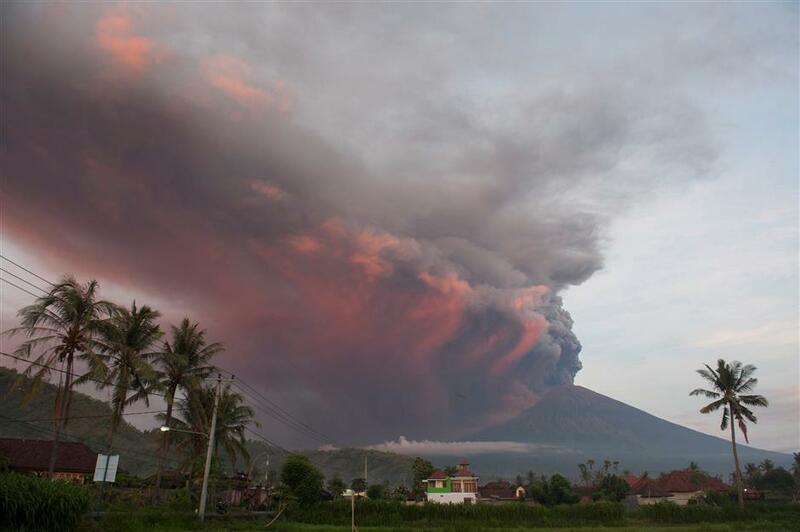 Indonesia also upgraded its Volcano Observatory Notice for Aviation to red, its highest warning, and said the ash-cloud top could reach 6,142 meters or higher. However, officials said the airport would remain open for now as the ash could be avoided. “The volcanic ash has only been detected in a certain area,” the airport and other officials said in a joint statement. All domestic flights and the airport itself were operating as “normal” and tests for ash had been negative, it said. Yunus Suprayogi, general manager of Bali airport operator Angkasa Pura I, said food and entertainment would be provided as well as extra bus services if conditions changed and passenger numbers increased. After resuming flights yesterday morning, Virgin Australia again canceled flights in the afternoon following a change in the aviation color code from orange to red. “Due to the significant volcanic ash and current weather conditions, we have made the decision to cancel the rest of today’s flights to and from Bali as a precautionary measure,” Virgin said in a statement on its website. AirAsia also canceled its remaining flights to Bali and Lombok. Qantas and Jetstar flights were continuing as of yesterday afternoon but Jetstar warned on its website that flights could be subject to change at short notice for safety reasons. Indonesia’s flag carrier Garuda said it was canceling all flights to and from Lombok.